We have all grown up with that nice old lady from down the street who gave us candy, baked us cookies, and signed the title to her old Nova over to us. 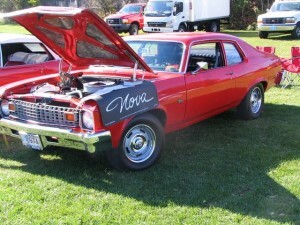 This Nova was given to Jim a year ago from Julie, a close friend of the family, who he will always treat as his second mother. Julie purchased the car brand new in 1974 and used it literally as a grocery getter and bingo cruiser once a week. She was hospitalized for several months and after returning home, she handed Jim the title while he was paying her one of many visits. Jim says, “This is truly the little old lady’s car from down the street!” The car had 28,000 original owner miles on the odometer and is powered by a 250 straight six with optional rear defroster. The car did sit for about three years prior to Jim working on it, so some rusting was inevitable, and a quick paint job was thrown on it for now. Once Jim can fully strip the car, he will spray it with a sweet paint job. The interior is currently being switched from Sandalwood to black. Future plans include a full body restoration and paint job and maybe even an engine upgrade in the next year or two. 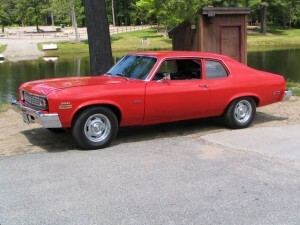 Jim says, “Although it’s not an SS or 68-72, it still draws a lot of attention and gets nice comments from the public.” Either way you look at it, a 1974 Nova from the little old lady down the street sure beats the cookies and milk most people are used to!